Join the discussion on our forums! Come discuss Electrowright over in our dedicated Electrowright discussion topic. Battlecry: If you're holding a spell that costs (5) or more, gain +1/+1. Carefully assembled from two Electrowrongs. I agree that other types of Big Spell decks do not really have tons of use for it. but it strikes me as a reasonably good card in some Spiteful decks. It would slightly smooth the damage from drawing a big spell early by giving you a tempo boost on turn 3 (or two w/coin). Sometimes you'd still prefer the big spells stay in the spiteful deck and that this be played as a 3/3, but not always... would depend on the match-up. Against some decks, this would give Spiteful welcome improved early board presence which could help it (thinking Spiteful Priest, Mage and Paladin more than Druid, as Druid doesn't want early creatures that don't help the ramp) against some match-ups in particular. It's okay, but I think it would be cooler if it got +1/+1 for each big spell in your hand rather than just one. Might have to be a 2/3 in that case though. No tribe, just a simple 3 mana "sometimes" 4/4. Only see it in Big Mage, and honestly they don't want this card at all. Might be decent in some new heavy spell archetype. Mostly mage that I have in mind. 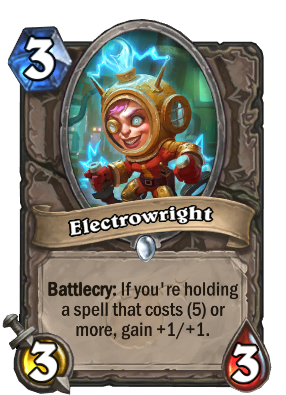 This card gives me Tinkertown Technician flashbacks. It probably isn't going to be that strong, but a 4/4 for 3 still just spooks me. Love that art. I just love old timey diving suits (As you can tell from my name.) As for the card, this was obviously built for big spell Mage which sadly hasn't seen any play in a long time. On the other hand, it's gonna be a really good Arena card.